Yale has pretty much dominated the lock industry for over 200 years; they invented the first pin tumbler lock after all! Yale certainly lead the pack when it comes to new ways to protect your home, so it’s no surprise that they have a range of smart home security products. We are going to look at the Yale Smart Lock collection and what it has to offer. The Yale Keyless Connected Smart Door lock gives you freedom to secure your home without the need for a key. Simple to use, you now have complete control on how you unlock your door. The Yale Smart Lock is compatible with most 60mm backset Nightlatches and this means that installation is quick and easy. You can go completely keyless and instead use the touch panel control, a key card, a key tag or remote access by installing an app on your smart phone. The Yale Keyless Connected Smart Lock comes with lots of nifty features that make it one of the most appealing smart lock you can get. One of these is the built-in tamper alarm that will go off at 80 decibels the moment it senses someone trying to mess with your lock. Another attractive feature is the 24 hour access code that you can use for guests; this stops you from having to hand out spare keys, which may fall into the wrong hands. Another good feature is that the code is automatically deleted after 24 hours, meaning that no one will be able to use that same code again. The Yale Keyless Connected Smart Lock is powered by 4 AA batteries and the Yale Smart Lock will warn you when the battery is running out. A cleaver fail safe that comes with this Smart Lock is that if it does actually run out of battery, then you will still be able to gain access to your home by simply touching a 9v battery onto the terminals at the bottom of the lock. This provides you with temporary power to unlock the lock; of course you do still need the method of keyless entry, i.e. the key card or your smart phone. 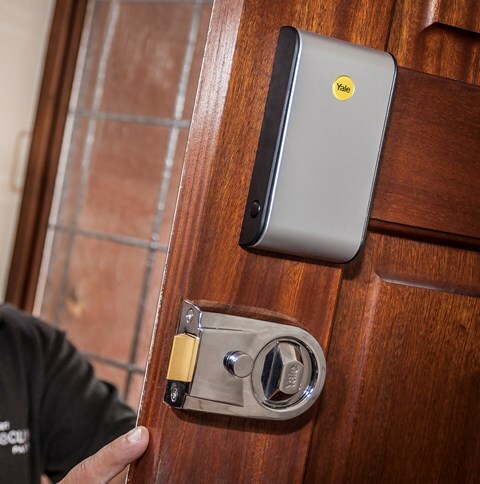 The Yale Smart Lock is perfect for those who have wooden doors with nighlatches, however it doesn’t work with uPVC doors and multipoint locks. The battery life is also questionable, with some users complaining the battery depleted very quickly. Aesthetically the Yale Keyless Connected Smart Lock is quite subtle, at a glance you wouldn’t suspect it was a smart lock, which may be a positive for you. As of April 2019 it is for sale on Amazon for £95, which is a reasonable for such a good smart lock with so many features. If you like the sound of the Yale Keyless Connected Smart Lock but don’t have a wooden door then never fear. Yale’s Conexis L1 Smart Door Lock is the smart lock you can get for your uPVC door with a multipoint lock. Just like the Yale Keyless Connected Smart Lock, you can go completely keyless and use a key card, key tag or your smart phone to access your home. Another feature that it shares with the Yale Keyless Connected Smart Lock is the tamper alarm. Statistics tell us that burglars like easy access, so if a horrendously loud alarm goes off when the tamper with the lock, they are more than likely to run away. A great little extra with this Smart Lock is that you can send virtual keys to anyone who has the app; this can be for a few weeks, or even a few hours depending on who you are sending the key to. The lock and app use Bluetooth to connect with each other meaning you don’t have to rely on an internet connection to gain entry into the house. The Conexis L1 Smart Door Lock will also let you know who coming and going, by knowing which mobile key has been used. The Smart Lock will send notifications to your phone with the identity of the person who has used a mobile key. If you’re into cool, quirky features then you will love the ‘twist and go’ option that comes with the Conexis L1 Smart Door Lock. You literally twist your phone in a 90 degrees, after tapping the lock with your phone. 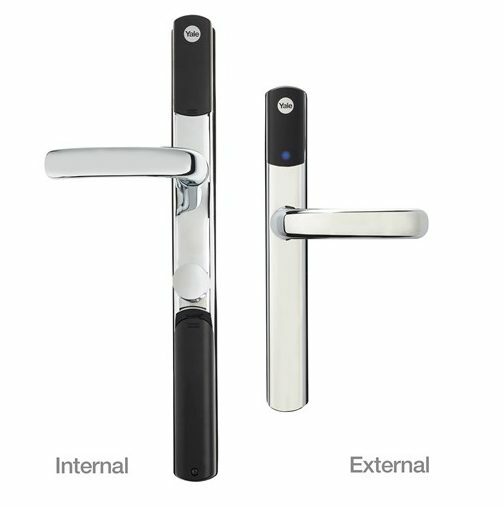 The Conexis L1 Door Lock is fairly complicated to install, so you may need to hire a professional to fit it correctly and not damage the door. It’s also a good Smart Lock to get if you don’t want a big glaring sign on your door that days ‘I’ve got a very expensive lock’ as it does just look like a normal handle for a multi-point lock. It would only be with proper investigation that someone may realise that it’s a Smart Lock. As of April 2019 it’s selling for £190 on Amazon, which is a bit on the pricey side, however you can trust that with any Yale lock, it’s going to be one of the best out there. Yale doesn’t have a huge range of smart locks, but they have definitely gone for quality over quantity. Whether you have a wooden door or a uPVC door Yale have got you covered. As well as including some fancy features at the heart of both the Yale Keyless Connected Smart Lock and the Conexis L1 Smart Door Lock is a solid door lock that will make you and your home more secure.